When on the hunt for a compact sedan or hatchback, you might not so readily expect to find a car that serves up a genuinely inspiring experience behind the wheel. The 2017 Mazda3 is the exception to the rule. Offered with a pair of capable engines under the hood and delivering dynamic responsiveness at every turn, the Mazda3 is capable of putting out up to 184 hp and can get up to an EPA-estimated 37 mpg highway. And that’s just the beginning! Before taking it for a test drive, East Hartford and Glastonbury drivers can take a closer look at the SKYACTIV® TECHNOLOGY that makes the Mazda3 such an impressive performance model in the compact lineup. 2.0L SKYACTIV®-G I-4 – The first two trim levels in the Mazda3 lineup come standard with a 2.0L SKYACTIV®-G four-cylinder engine that’s good for 155 hp and 150 lb-ft of torque. This model uses Variable Valve Timing (VVT) and Advanced Direct Injection to help it get up to an EPA-estimated 37 mpg highway. 2.5L SKYACTIV®-G I-4 – If you opt for the Touring 2.5 or Grand Touring model, then you’ll get a 2.5L four-cylinder engine that utilizes Variable Valve Timing (VVT) and Advanced Direct Injection to produce a confident output of 184 hp and 185 lb-ft of torque. Even with the more powerful engine, the Mazda3 is still able to get up to an EPA-estimated 33 mpg highway. The elements of Mazda’s commitment to performance via SKYACTIV® TECHNOLOGY are not relegated solely to powertrain and drivetrain, though. The platform also accounts for the body and the chassis design of the Mazda3, helping to boost the overall driving experience of this vehicle. Built with ultra-high high-strength steel at critical points, the Mazda3 remains lightweight and attuned to the road, delivering a nimble response around city streets and on the highway as well. The engineers at Mazda never stop working to perfect the experience of being inside a Mazda, which is how they came up with SKYACTIV®-VEHICLE DYNAMICS with G-Vectoring Control. This system is able to adjust the amount of power being delivered to the wheels while also shifting the weight of the vehicle based on your driving patterns. The result is greater comfort for you whether you’re on a long trip or just cruising around town. Are you ready to see how the 2017 Mazda3 feels on the road? 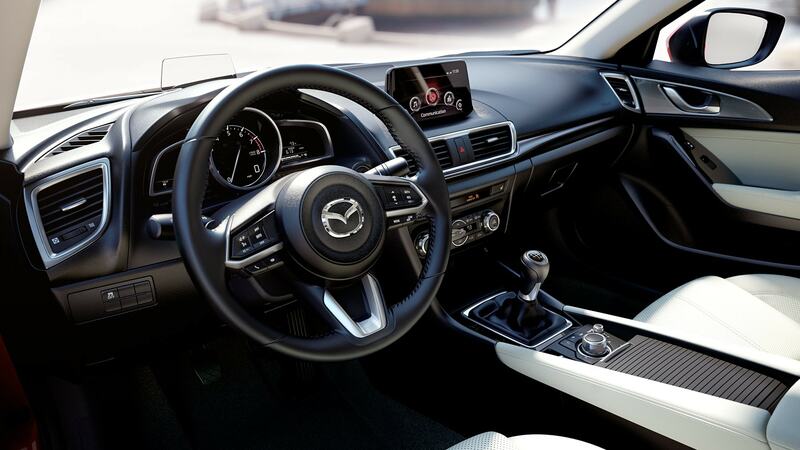 You can find the new Mazda3 in both sedan and hatchback versions right here at Mazda of Manchester, located at 80 Oakland Street in Manchester, CT, just 10 minutes from Hartford (Exit 63 off I-84 East or West). Gladly serving drivers from South Windsor, Vernon and your town too. We’re open every day, so stop in for a test drive at any time. If you have any questions, feel free to contact us!